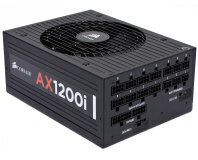 Seeking to please computer users that have a system that's power ravenous, PC Power & Cooling has launched its Turbo-Cool 1200 PSU. COMPUTEX 2007: HIS is about to enter the power supply market with three different types of unit. When will we have enough Wattage? COMPUTEX 2007: 1000W, 2000W? When will we have enough? We talked to Thermaltake, Silverstone and BeQuiet about their latest products for power hungry boxes.